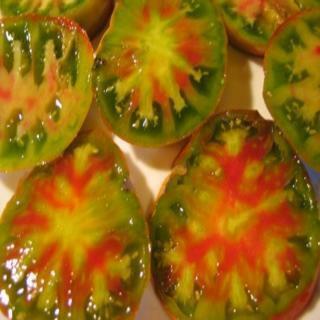 The tomatoes from this seed are oxheart shaped, only are a bit more squat with blunt ends. The exteriors are a metallic bronze - russet with chartreuse shoulders. Interiors are neon shades of greens, orange and hot pink and will really wow you. Heirloom Seed Packet. When I sliced open my Everett's this summer, I nearly fell down on the floor! I have never seen such a gorgeous tomato! This is what I would call a brown tomato, like Mr. Brown. They are oxheart shaped, only are a bit more squat with blunt ends. The exteriors are a metallic bronze - russet with chartruese shoulders. Interiors are neon shades of greens, orange and hot pink and will really wow you. Flavor is outstanding, somewhere between a zippy green and a real acidic red, but with just the right amount of sweetness. Awesome!